Ok I really should be studying. Finals week has occurred upon me, and let's just say, sometimes I wish it didn't dawn on me early in the semester that I'm a senior. In any case, I've resorted to all sorts of procrastination, which leads me to be typing this right now. 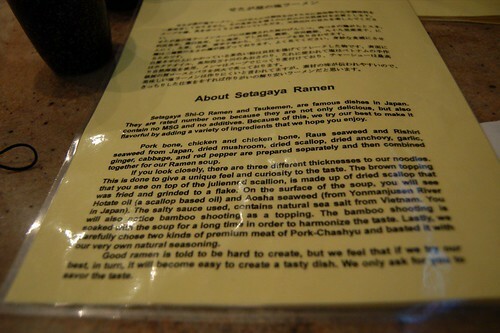 Many a ramen joint have sprouted up in the East Village, but Ramen Setagaya stands to be one of the more boastful. It took them a while to open up, and in the meantime there were always news briefs about them saying they're more authentic than everyone else. It is not every day that we see so much drama surrounding carbohydrates - it's almost as entertaining as watching Lauren Conrad's life play out. During my internship, I had a weekend afternoon off, and it also turned out to be one of the hottest days of the summer. With it being in the 90s with crazy humidity, what better way to spend the day than eating a steaming bowl of ramen? Of course, I am not new to this masochism game. As you can see from the top picture, there was a pretty long line at around 6 on a Sunday. We waited outside in the scorching heat for around 45 minutes, but that was not the painful part. They place a tv in plain view of the people waiting in line, playing clips of Asian cooking shows, noodle making documentaries, and every other possible media that would make you really want to eat at that moment. 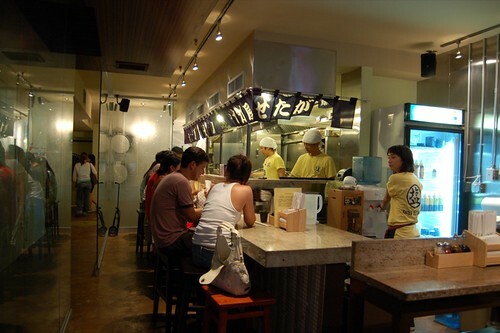 The menu is pretty simple, consisting of only several types of ramen, gyoza, and some other appetizers. I don't think they have yakitori quite yet. C and I ordered their trademark shio ramen, which came topped with pork, marinated bamboo, seaweed, a soft-boiled egg, and some scallions. Though I was dying inside the un-ACed restaurant, I concluded right then that Ramen Setagaya might just be serving the best ramen in the city. The pork was melt-in-your-mouth creamy and ultra-flavorful, and the soft-boiled egg was the perfect doneness. 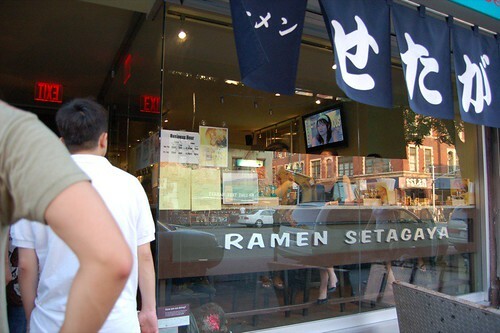 The noodles were my favorite part by far of any NYC ramen joint I've tried. They are slightly firmer than average, and maintain an element of chewiness and resistance even as they are soaked in the broth. 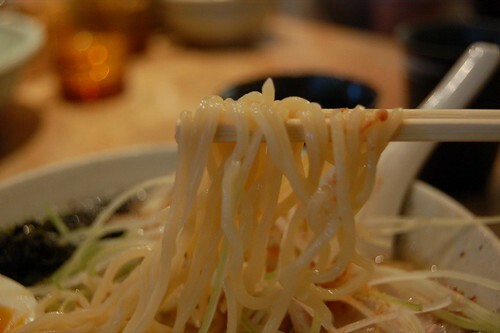 The broth itself is delicious as well, so smooth and lingeringly rich, without any heaviness. C and I were almost near tears from the pain of eating the steaming bowl of noodles, but we kept eating, it was that good. At one point, we were wondering whether this heavenly broth was enhanced by MSG. No. 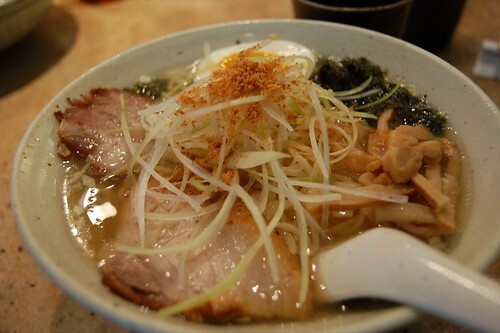 According to the handy menu, "pork, bone, chicken, chicken bone, Raus and Rishiri seaweed from Japan, dried mushrooms, dried scallop, garlic, ginger, cabbage, and red pepper are prepared separately and then combined together for the ramen soup." They also use anchovies, scallop oil, natural sea salt from Vietnam, and other delectable things in their bowls. All I can say is Damn, that is some good ramen.